I've been reading some thought provoking articles concerning the curious mixing of Christianity and the martial arts. Patrick Parker's guest post at TDA Training was a response to Bob Patterson's original essay, and both provided good material. Now it's my turn, but instead of discussing Christian values' fusion with Asian combative systems and the advent of Christian martial-art organizations, I'll be taking a different slant: Devout Christians who are opposed to certain aspects of the martial arts, in particular Eastern thought's influence on them. 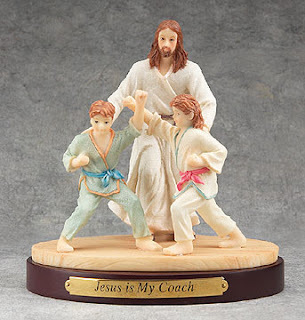 Recently I received an email from a reader (a Christian) who asked me to suggest a martial arts program for him, one that didn't include "Eastern religion" as part of the package. I obliged, explaining that while Taoism and Zen are the philosophical foundations that most Asian martial arts are built upon, they are not theistic religions as we understand them in the West. Bowing, meditation, and other forms of dojo etiquette could be misconstrued as paganism to an outsider, but they're just part of the stock ritual that exists at most schools. A born-again Christian who I trained with years ago refused to wear the Isshinryu karate symbol of the mizu gami - the water goddess - on his uniform per a certain Biblical commandment. I explained that the Isshinryu patch or any other school emblem was not designed to usurp divine authority, but he wouldn't budge on the issue. The non-Christian Asian view of an almighty omnipresence is somewhat vague. In Taoism, "The Way" itself is sometimes equated with God. Zen, a common metaphor for the martial arts (and vice versa), does not recognize a Supreme Being whatsoever. Shinto is a unique religion indigenous to Japan that has no founder or moral code, but features an array of deities (kami). Aikido founder Morihei Ueshiba actually saw himself as a Shinto demigod, and stories of the O'Sensei disappearing in a flash of light to avoid bullets from marksmen only fostered his reputation as a mystic. The martial arts should be presented as a secular discipline and are totally compatible with holding strong Christian views. Any references to the Buddha or Bodhidharma (the mytho-historical founder of Zen and martial arts in China) and the like are largely unnecessary and should be taken with a grain of salt. I really like this one, post that is. This is an issue that those of religious fervor are most confused about when taking on training in a traditional and/or classical dojo. I think that it comes to semantics in one case. Calling the underlying philosophy of a Martial Art "Eastern Religion" is a huge mistake. I also feel that true understanding of that esoteric portion of Martial Art training is not understood nor is it explained adequately to most students let alone those of a religious background. This is a shame. When you read the Tao Te Ching is is clear that it has no religious doctrine. It focuses on nature itself which does not fall into any religious category. Yet, you find a lot of interpretations of that book with direct reference to some religious icons such as the word "God". This comes from the background of the person translating the document. When you come to understand the full meaning behind the me-gami you realize it is simply a representation of a Martial Art Philosophy. I feel that it gets the backlash from religious minded folks simply because those who tell how it came to be refer to the woman as a goddess which triggers that knee jerk reaction that to worship such things is not right. 2. Be truthful at all times. Now, if you want we all can get into a heated discussion on the subject of which is correct, Mizu-gami or Me-gami! In the end, if I have a person of strong religious fervor who wishes to not participate in such things involved in reishiki with out a open minded understanding of what is actually occurring then they can participate with out doing it. After all, we are American's first and as one very famous Sensei said (approximately) we teach this way because we are Japanese, go home and teach as you are, American. You are like a banana. You are like an egg. The banana is yellow on the outside but white on the inside. The egg is white on the outside, but yellow on the inside. Religion, always such a debate! I like this post too. Religion can be a sticky subject, but I think you addressed this very well, and I agree with your position. I think the interesting thing about where I go for TKD is that it's truly a melting pot of cultures and religions due to the area I live in. Let's see, the owner/head instructor is Jewish, as are many student, plus those from Judeo-Christian based religions, but we also have a very strong Asian population where I live, so there are a lot of Hindu, Muslim, Sihk and other groups as well represented at our school. I know that the philosophy of my TKD network is such that it's more..."universal truths" that are promoted, like learning what discipline, respect, perseverence actually means. "Yes I can" vs. "No I can't" sort of thing is also a big part of it. Training in martial arts, is more about learning the ways of a culture, not a religion, although some treat the latter as such when that's not necessary. interesting article. My only comment is more practical than philosophical. If someone asks you to recommend a martial art free of eastern religion, why not suggest a western martial art? Savate, western boxing, catch wrestling or sambo. So often when somone says martialarts we immediately think it should involve eastern philosophy and be of easten origin. My student base has a wide range of cultural and religious diversity; I have never had anyone take issue with bowing, our student oath or other things that could be misconstrued as "eastern religion". This conversation does come up though, mostly with people who are unfamiliar with martial arts outside of Kung Fu movies, and even less familiar with Eastern Culture and Religion. Bowing, meditation, and other rituals in a dojo are not done (at least in my experience) for religious reasons, but rather to show respect to those who have come before you, those who are instructing you, and as a respect overall to the study of the martial arts. I can't understand why a Christian would be offended by showing respect to others. I guess some schools have more of the ritual than others, but I've never found my style's rituals offensive in any way. Yeah, that pretty much says it. People just want to believe in some kind of magic. It's a form of escapism from the humdrum of reality. Training in martial arts, is more about learning the ways of a culture, not a religion, although some treat the latter as such when that's not necessary. The cultural and historical aspects are important. And very interesting too. I really think that without an understanding of at least the ethnic culture of an art, the student might be missing something. But Western religious followers tend to be very exclusive in their ways. Christians in particular see something like meditation as antithetical to prayer. I don't think there's an emphasis of religion in any martial arts school (at least that I'm aware of), but some of the practices can be perceived as such. If someone asks you to recommend a martial art free of eastern religion, why not suggest a western martial art? So often when somone says martialarts we immediately think it should involve eastern philosophy and be of easten origin. To tell you the truth, I didn't even think of that. It's funny, I just visited a Shotokan school that offers sambo. Don't forget, it's not the style, it's the instructor presenting the art. I can't say for sure, but I'm going to bet that some of these Western styles you mentioned may be getting dressed up with some Eastern doctrinal material just to make it look more interesting or esoteric. A savateur could be required to read The Art of War or Book of Five Rings. Sportive styles such as the ones we do tend to gloss over the Eastern aspects, such as Zen. Many arts have become Westernized. For a more detailed explanation, see my response to BBM. Definitely. Much of it has to do with the style. Internal arts tend to be more "spiritual" than external styles such as karate and TKD. I noticed this when I took aikido a few years ago. The class began with the sound of a gong (taken from Zen), whereupon we bowed in seiza (yogic style kneeling) and then meditated. Certainly seeing that could arouse concerns in some people. I think bowing respect to others is fine for us Christians, as the object of respect is not spiritual, it is cultural. If the object of respect is intangible then it is spiritual. Eastern philosophy usually did not pay respect to a personal God, but to a single "consciousness" or "universe" forces that is all-encompassing in the world, Pantheistic, so to say, the concept of Tao, Atman, and all others. This concept of holistic view, that all things are essentially one, is shown in eastern MAs, that the whole body contributes to a single movement, that the energy of a strike can come from dantian, hip, legs, and ground. Also, a single move can be used in a lot of ways. Western ancient philosophy, in another manner, did not really have a single, all-powerful God, but did have a lot personal gods (they have their own character and personalities, zeus, hades etc. ), but yet they are dedicated to their own "job", to manage skies, underworld, sea etc. This reductionist view from the old western world that contributes to the science we see up to newton's age, can be seen in western MA's that will contribute strikes to a single application, and we would not see as much whole-body strikes as in the east, that each of the limb will do their own specific tasks. The underlying concepts of a non-personal, all powerful God and the personal, not-all powerful gods are rejected by us Christians, who submit to a personal, all-powerful God. Yet I think we can always take benefit from the culture and learn the arts, without submitting to the spiritual aspects. I believe that people can develop religious oversensitivity. I remember a person who refused to eat a Mars chocolate bar because he felt that the stylized M on the wrapper was too similar to a demonic symbol. I really doubt that I could have committed any horrible sin by enjoying a few minutes of caramel, chocolate, and nougat, regardless to what is written on the package. All that I know is: for this person, eating Mars bars is dreadfully sinful. For me, it's nothing big. To each their own. He can't convince me of his philosophy, and I can't show him mine. I just let him go on his path, and I keep walking on mine. Hey John - thanks for posting on my freshly created wordpress site. Its always nice to see some other Isshin Ryu practitioners around on the WWW. I agree completely - martial arts in itself doesn't need a religious basis. But, in my case, my religion compliments my martial arts style, and vice versa. Have a great day! I'll link to you, if you'll link to me(paganliving.wordpress.com, if you've forgotten) - I fully plan on posting more about the subject. American Kenpo is a perfect style for those who want to keep the Eastern religious-ness out of karate. At least it was at our school. Interesting debate. I think mostly this comes down to a differentiation between spirituality and religion, which are not always the same thing. For me, training in the Martial Arts is part of a very personal belief in the unity of body, mind and spirit - what you do to the one, affects all the others. To me, Kung Fu has a definite spiritual dimension that I don't get from doing weights or aerobics. I agree with Supergroup7 and Falconrider - to each their own and this is what works for me. Having said that, I have trained with Shaolin Monks, who are of the firm belief that in order to get the best out of the art, you have to get to grips with Buddhism. And that might upset those of other faiths. For me, I'm just happy walking my path. Kung Fu helps me do that with more discipline, confidence and strength.